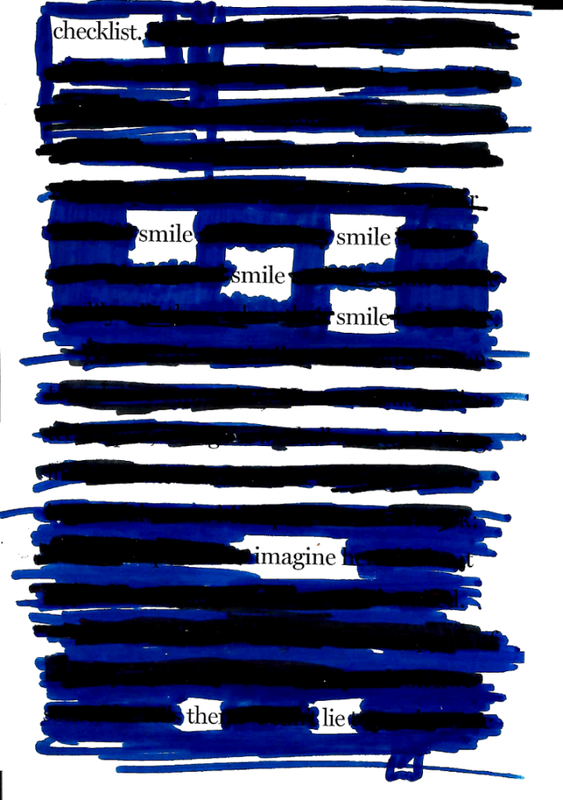 What I like about blackout poetry is that it’s sort of an inverted version of pinhole cipher, where a hidden message is concealed in printed matter by pinholes under the words of the real message. I used to make pinhole ciphers on discarded newspapers in cafeterias and coffee shops, just in case someone noticed. If I had nine lives, I’d use one of them to be a spy who retires and opens a coffee shop. Preferably, the spy part would be in the early half of the twentieth century, before analogue cryptography was completely outmoded. With blackout poetry, I can just sort of pretend that someone sent me a secret message and pick out whatever words or syllables interest me. I didn’t have any particular plan when I did this one, but it’s clear to me that this poem explains how I deal with a lot of social niceties, particularly being asked how I’m doing when I’m not doing well, but I don’t want to say so. Smile, smile, find some sort of lie, and try not to sigh depressively. Not that I would put on such a charade at my spy coffee shop. I like to think I foster an atmosphere of erudite grumpiness. Tagged art, blackout poetry, coffee, cryptanalysis, depression, sneakiness, spies.